Legal Background – Associate, Callaway & Vance, composed of now deceased Circuit Judge of Jefferson County, Clyde W. “Dugan” Callaway, Jr., and Robert S. Vance, the late esteemed judge of the U.S. Court of Appeals of the Eleventh Circuit. In addition to Plaintiffs’ personal injury cases, Thompson assisted in the preparation of complex class action litigation against cast iron pipe manufacturers, various companies on a claim of price fixing of antibiotic Mycin drugs, price-fixing by school bus manufacturers in the states of Alabama and Mississippi and claims of usurious credit card interest being charged by national banks in the State of Alabama. All of said cases were successful. Senior Trial Counsel – As senior trial counsel, Thompson has gone on to try hundreds of cases primarily from the Plaintiff’s side. He has successfully prosecuted securities fraud cases, air crash cases, car crash-worthiness cases, wrongful death cases and other complex litigation. He now specializes in class action litigation, mass torts. securities fraud and investor arbitration claims. Thompson has successfully settled seven figure cases from the Plaintiff’s side as well as achieving Plaintiff’s trial results of seven figures. Mr. Thompson has successfully represented hundreds of clients who have lost huge sums. 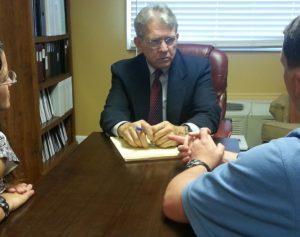 Subsequent to his courtroom successes in vehicle roll-over, air crash deaths, drug claims, personal injury, fraudulent sales tactics and financial fraud, Mr. Thompson has for the last decade focused his law practice on investors’ claims. Due to the confidential nature of these clients and former clients’ cases, Mr. Thompson is professionally prevented from disclosing their names and the extraordinary results. However, he has accomplished success in over 90% of the securities cases he has handled, which he began prosecuting in the mid-1980’s. He has seen six and seven figure results in court trials, settlements as well as arbitration. Under the present law, virtually all customer investor claims against brokerage firms have to be litigated in arbitration, in which Mr. Thompson has had remarkable success. He has pursued and prosecuted claims against all major brokerage houses, including Merrill Lynch, Morgan Stanley, Morgan Keegan, A.G. Edwards, Edward Jones, Aura Financial, Wachovia, South Trust Securities, Raymond James and much more. Joint Lead Counsel for national class action against Blue Cross/Blue Shield. ongoing as of 2018. Joint Lead Counsel for national class action against General Foods, ongoing as of 2018. Joint Lead Counsel for national case against a prominent nut processor. Ongoing as of 2018. Joint Lead Counsel for national case against Kellogg’s inc. Settled in 2010. Joint Lead Counsel for pending case against National Law Firm, 2013-Current. Chrysler Multi-District Litigation – Thompson spent the years 1989, 1990, 1991 and a vast majority of 1992 as plaintiffs’ lead counsel for opt-outs in a multi-district case, before the Federal District Court in St. Louis, Missouri, Chrysler was accused of having disconnected odometers on new cars, allowing their plant supervisory personnel to drive said vehicles as company vehicles, reconnecting odometers upon their being returned to the plant and then cleaning them up and shipping same as brand new. A test case was tried in St. Louis state court with Thompson as the lead trial attorney. The jury awarded Plaintiff $1,040,000. The remainder of the cases settled under terms of confidentiality. South Trust Securities Class Action – this case was a class action brought as two cases on behalf of investors in a beef raising program. The cases settled after two years of preparation – terms of the settlement were confidential, plaintiffs were happy with the result. Car Crashworthiness litigation – the client was a quadriplegic. The suit was based on inferior roof design allowing tree limb to crush in one car collision. The case settled under confidential provision. The client was quite pleased with the result. Automobile Ad Valorem Tax Class Action – the subject case was filed against the State of Alabama on behalf of all motorists claiming that the State of Alabama was not assessing autos and light pick-ups properly for ad valorem tax purposes. Said case settled for $8,000,000. Truck Ad Valorem Tax Class Action – similar to the above case but based on over-the-road-trucks. Said case settled for $18,000,000+. Air Crash Case – Kansas City, Missouri. Mid-air collision causing death of co-pilot. Along with two other attorneys, Thompson tried the case to $1,000,000 jury verdict.